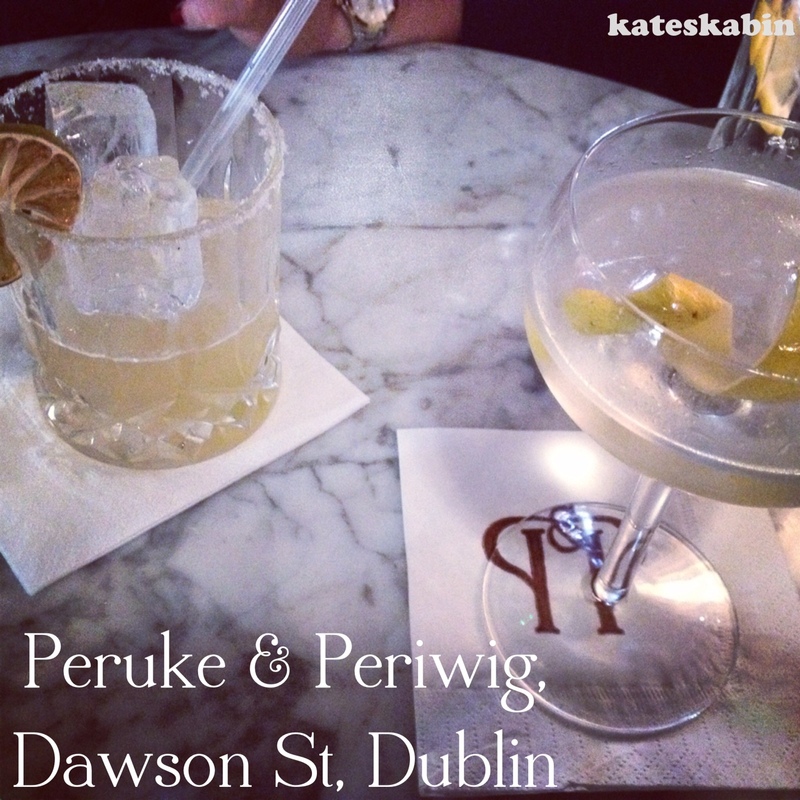 It’s been on my list for months now and recently I FINALLY got around to eating in Peruke & Periwig on Dawson Street. I had been in numerous times for drinks but was yet to try the food, and after seeing a couple of other bloggers praise it, I decided I had to visit! It’s run by the same crew who run Vintage Cocktail Club & The Liquor Rooms, and again the emphasis is on the cocktail menu. 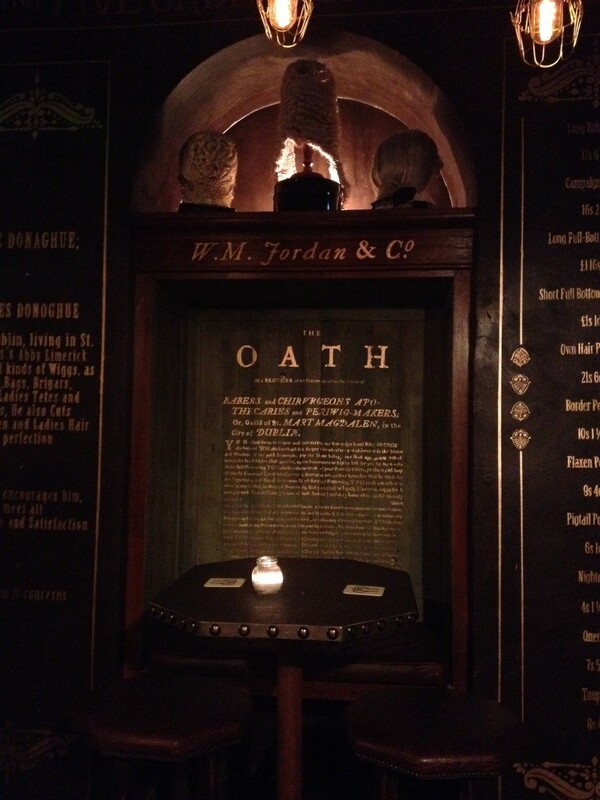 The interior of the dining areas upstairs is similar to the other joints but the downstairs bar is all dark wood and walls adorned with wigs! Here you can have drinks and order some bar bites. 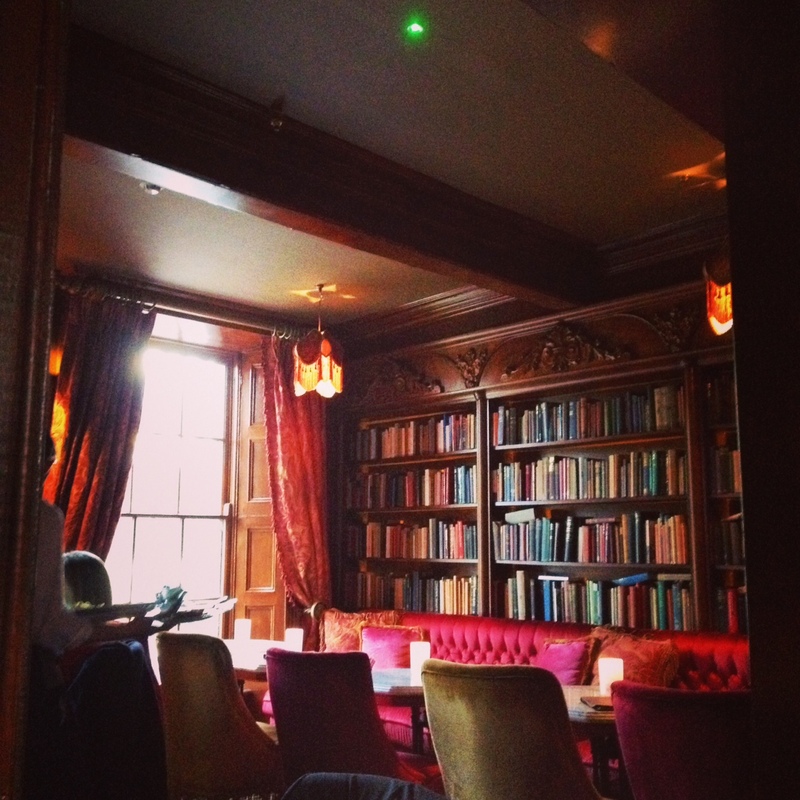 We trooped up the narrow stairs to the third floor of dining space and were shown to our seat. It was early evening so not too dark inside… I’d imagine later in the evening it would be even more atmospheric. We started off with a few cocktails to keep us occupied while we looked over the menu. I went for a Bonded Martina and C (from blog Gin & Griddle) went for the Dia Del Muertos (Margarita). We both agreed we fancied a tasting a few dishes instead of sticking to main courses so we ordered a few bits from the starters and sides section. 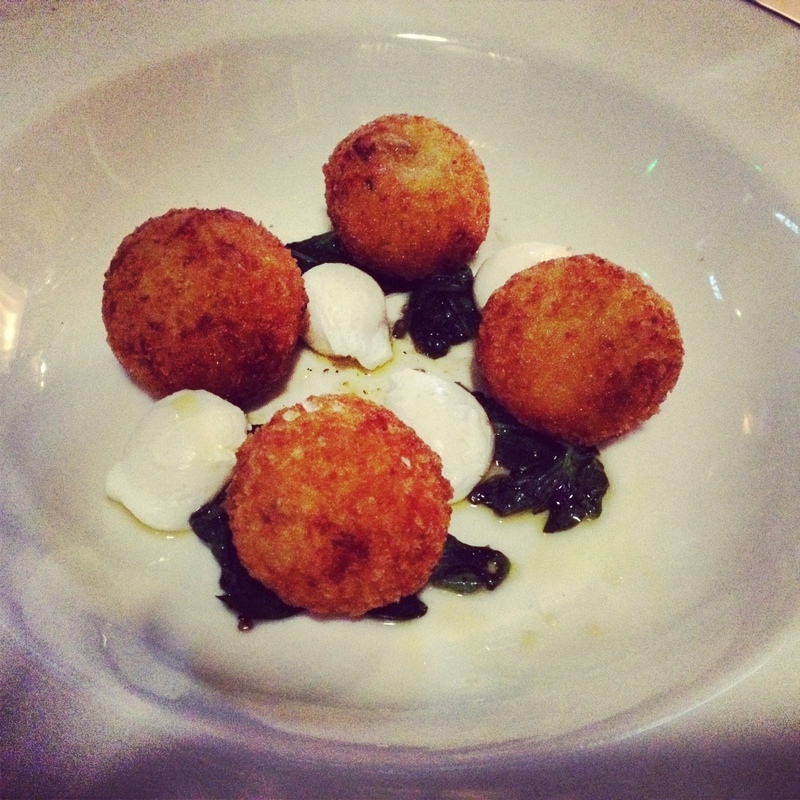 I will start with the standout dish… Wild Mushroom Risotto Balls with Baby Spinach and Poached Quail Eggs & Truffle Oil, €11. Well… these were DEVINE! A crispy exterior gave way to a gorgeously soft interior with plenty of flavour thanks to the parmesan. I could have eaten all of these myself! 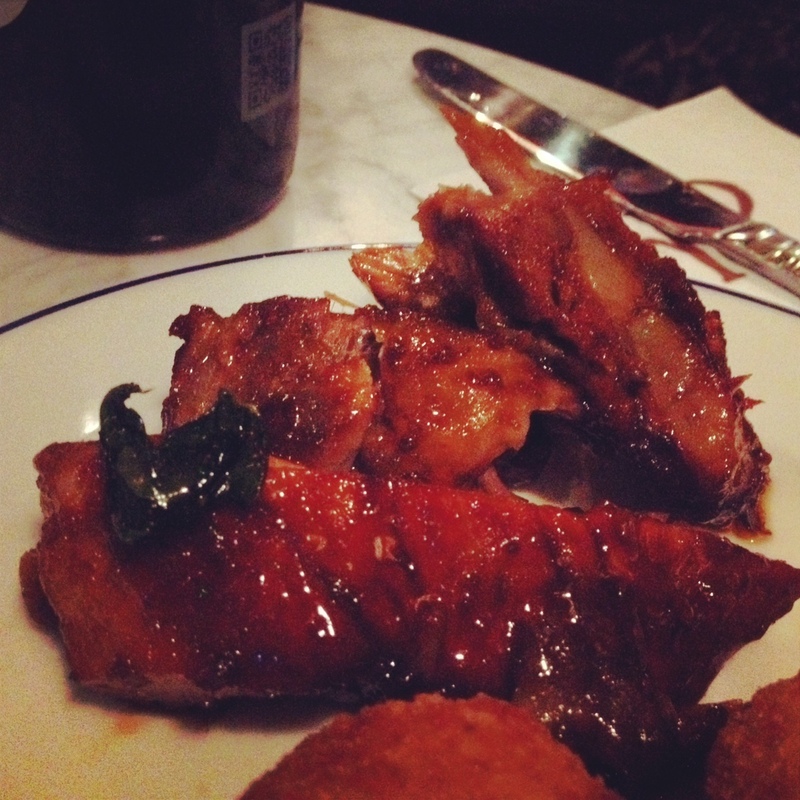 The Sticky Pork Short Ribs with Apple Cider and Whisky Glaze, €11, were equally great, the soft meat fell from the bone. 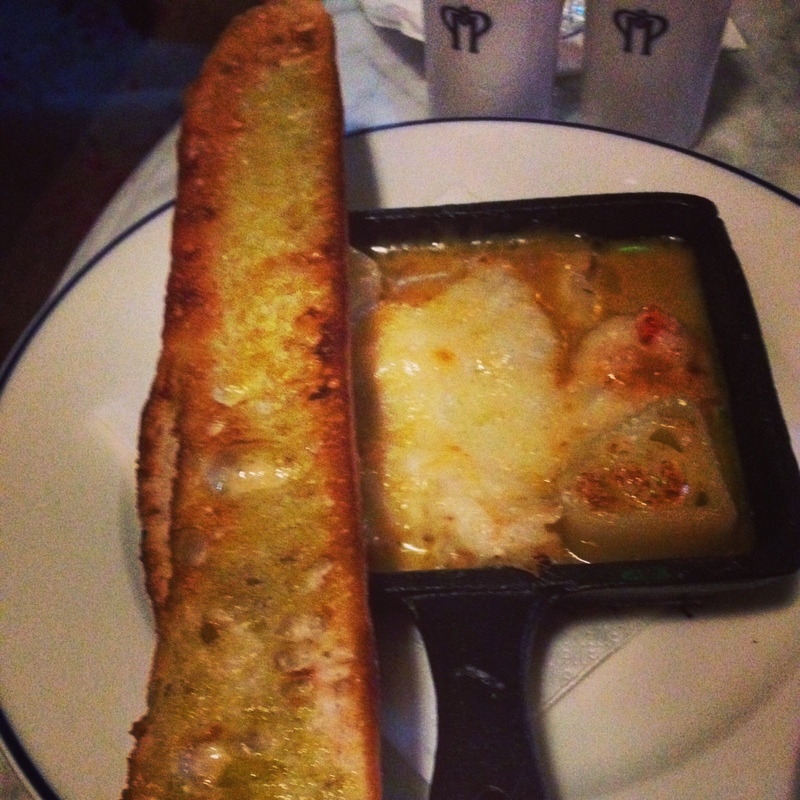 I am a huge fan of gratin so was excited for the Smoked Haddock and Dublin Bay Prawn Gratin with Braised Leeks, Gruyère Cheese and Crusty Bread, €12.50. Through no fault of theirs I have decided I don’t like leeks – but enjoyed the rest of this dish. 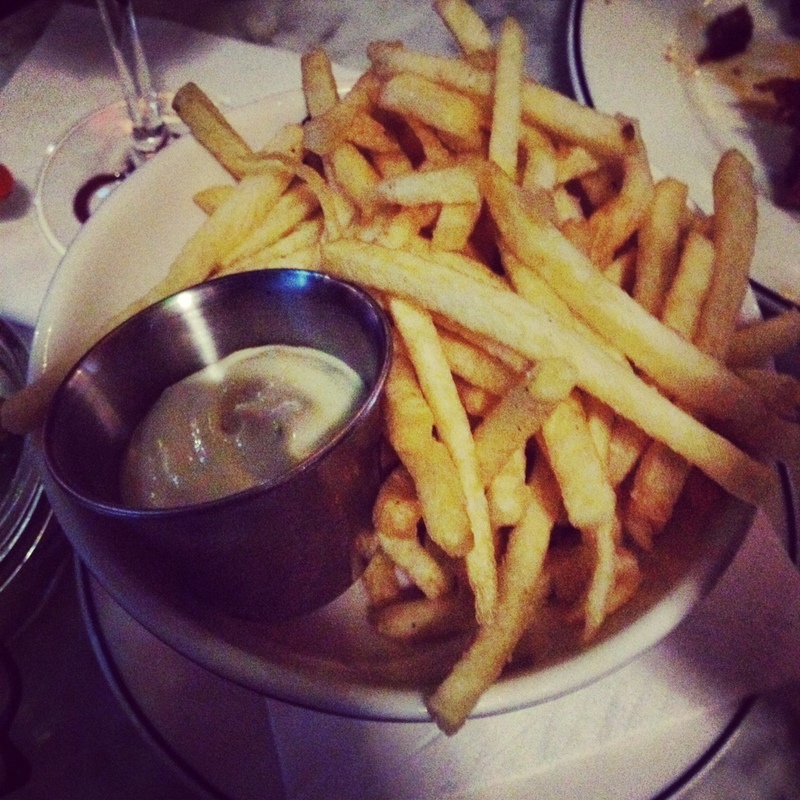 And to accompany all these delicious dishes we had some shoestring fries with mayo. Delish! We had a little break here and enjoyed a few glasses of wine which we’d ordered by the bottle. The dessert options were right up my street with a cheese board, Panna Cotta, Creme Brulee or Chocolate Fondant being the options. We chose the fondant with Pistachio Custard and Fresh Raspberries, €8. 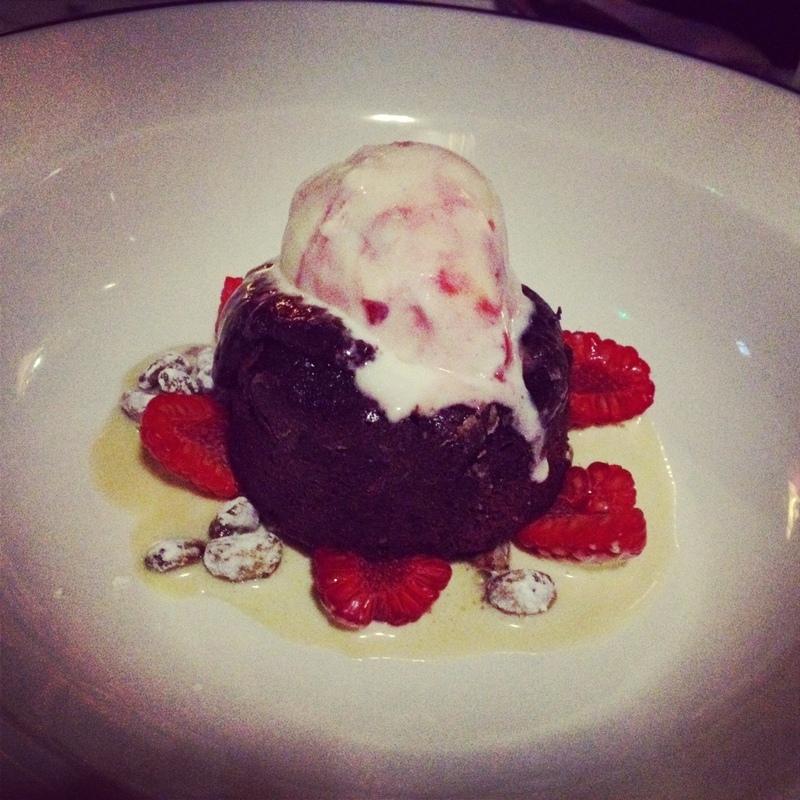 It was fabulous with a delicious runny centre – it didn’t last long at all between us! After all of this we were both stuffed so sipped over the last of our wine and got the bill. I have to say that the food was absolutely fabulous. I have only one complaint to make of Peruke and I am not alone in this as have heard others say similar. The cocktails, while tasting great, are priced at about €12/€13 and in my opinion are overpriced. The glasses were nowhere near full and we felt pretty hard done by. I certainly couldn’t afford an evening drinking cocktails here which is why we switched onto the wine after our first drink. Other than that I enjoyed it and would definitely return for wine and bites. 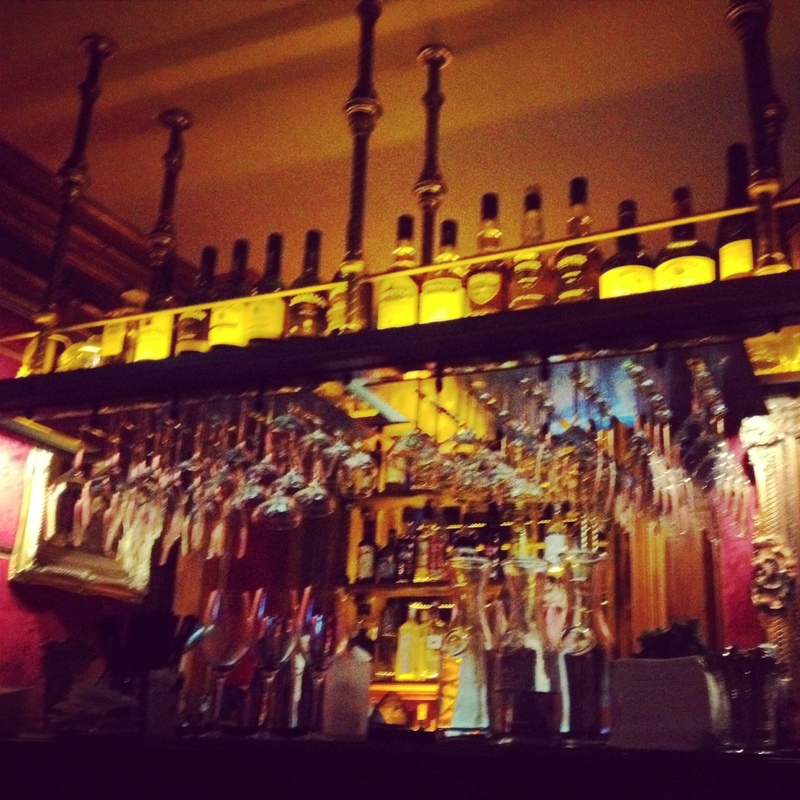 Peruke & Periwig, 31 Dawson Street, Dublin 2. Hi Helen – thank you , am delighted to hear you enjoy reading the posts! Have you tried Shanahan’s on the Green? I went there for an Early Bird (it’s v pricey at normal price!) and it was fab, it’s blogged here around last October/November if you want to have a read. Also have a look on the net at Thorntons!